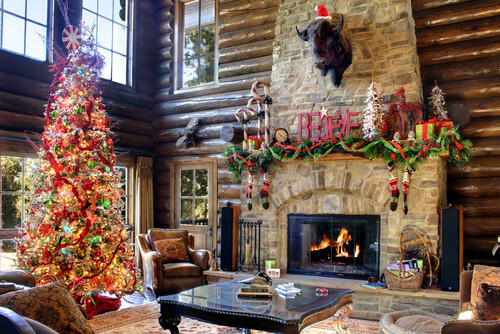 The fireplace is one of the focal points for holiday decorations. Next to the Christmas tree, the mantel is probably the most popular location for decorations. 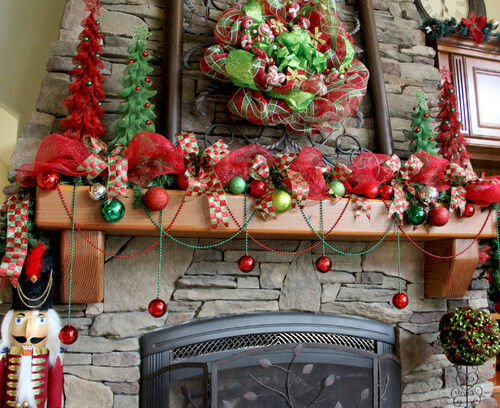 So, in the spirit of the holidays, I am presenting these 18 Christmas mantels for your enjoyment. Hopefully, they will inspire some great ideas for your own home. 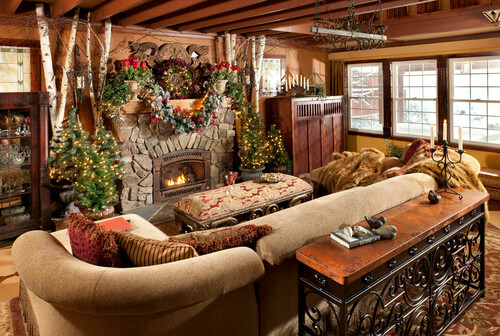 There’s just something about a stone fireplace that makes me feel all warm and cozy. This is even more true during Christmas time. I guess it is that image of a crackling cabin fire out in the middle of a snowy nowhere, or maybe it is the thought of a holiday ski lodge. 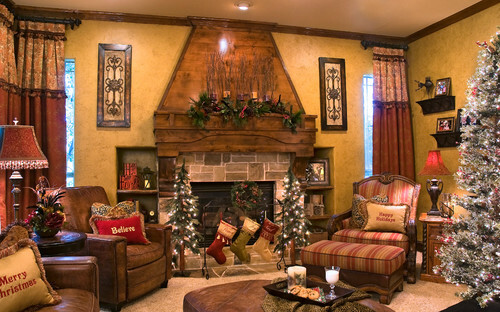 Whatever the reason, I tend to prefer the Christmas mantels that are decked out on a rustic fireplace. 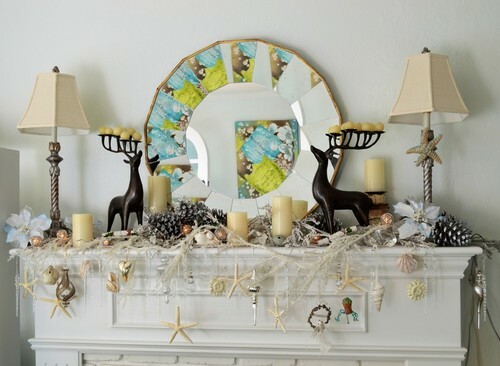 This is a small mantel decorated in all muted beige tones, but somehow it seems to work. If you prefer understated, maybe this mantel is for you. I love the way that they incorporated birch tree branches into this holiday decor. The white of the tree stands out nicely against the wood tone of the wall panels. Simple and tasteful. 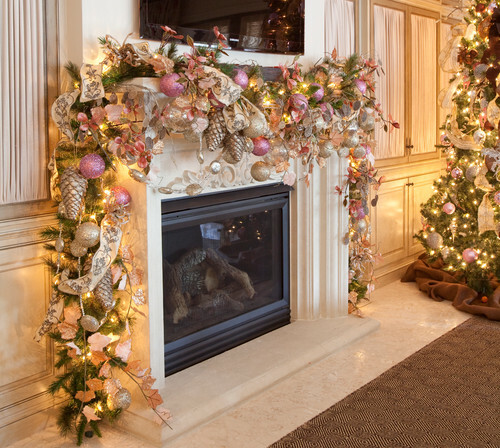 Instead of hanging the wreath and stockings up high, they opted to hand them off the fireplace cover, right in-between the two miniature trees. Decorating like this draws the eye down to the seating level. 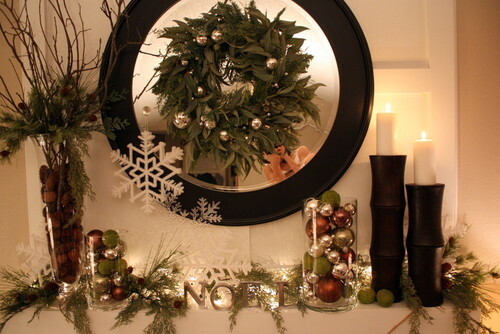 One of my favorite ways of decorating the fireplace is to hang a wreath over a mirror, the way that they have done here. It is a nice way to incorporate the wall decor that is already hanging in this location. I also like the idea of using the grapevines for garland. If you have a limestone or marble fireplace surround, this may inspire you. 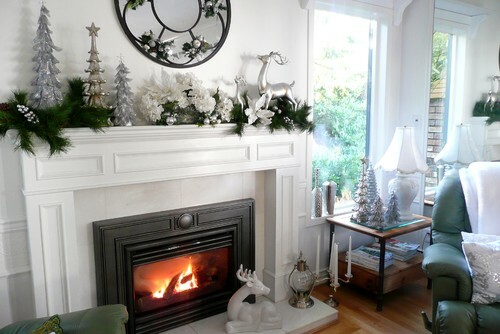 Notice how they have chosen silver accents to tie in with the gray tones of the mantel. 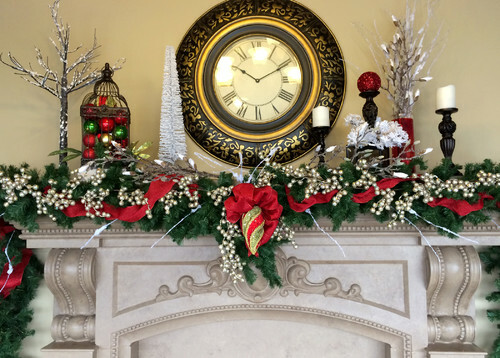 Just as the previous decor utilized silver, this mantel leans toward gold. So, the decorations look nice when gold accents are added. You’ll notice that the gold here is not a brassy shade of gold, but instead is a more muted tone. Think that those black accents from Halloween won’t work with your Christmas decor? Think again. Notice that the mirror and the candle holders are black. Up against the white backdrop, this can work nicely. 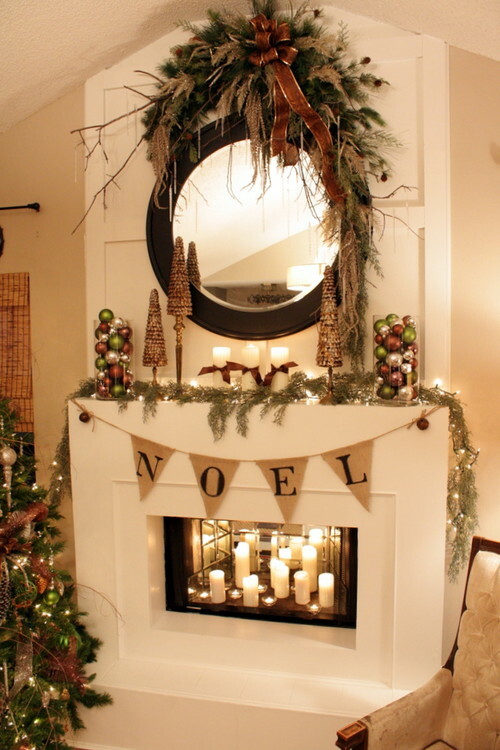 Just add some earth toned decorations, hang a wreath over the mirror and change out the orange candles for white ones. Don’t care for the flashy red color that is traditional to the Christmas holiday? Then, just use the metal shades of your choice. 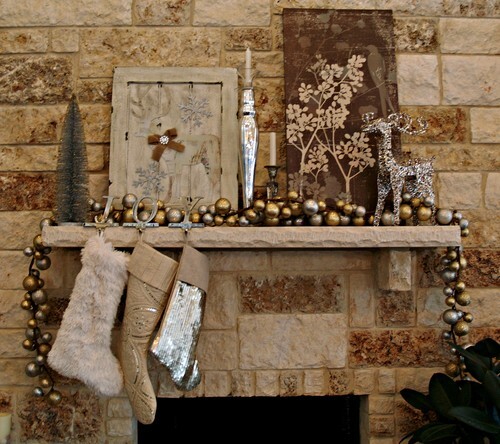 Here a mix of silver and gold holds its own on this Christmas mantel. 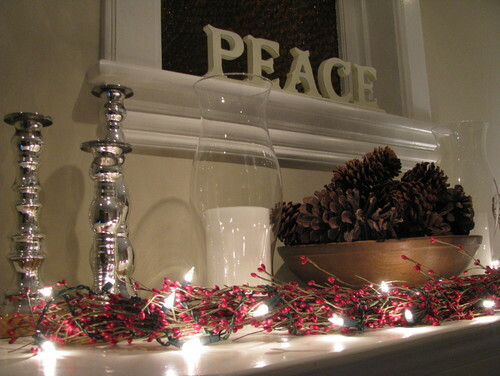 This Christmas mantel was just too cute to pass up. Who says you need holly and pine trees to create Christmas decor. 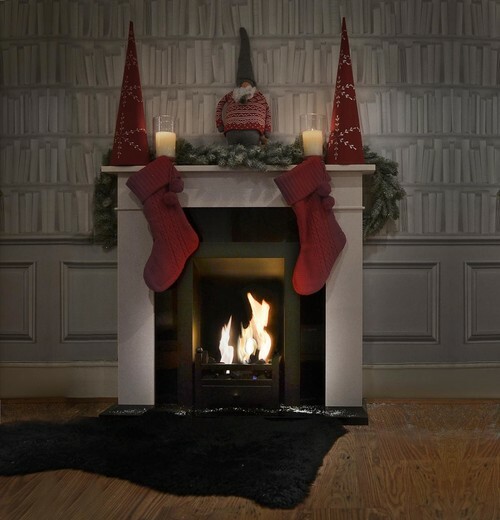 If shabby chic is your style, then you probably will like this mantel. 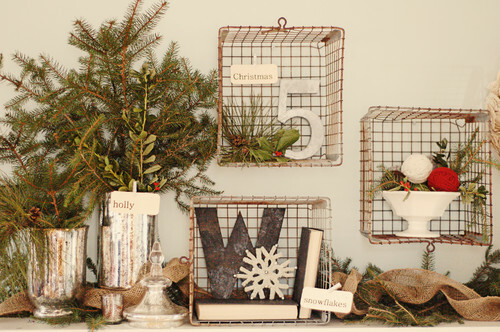 A few old baskets are used to create staggered wall art that can be used during the holidays and throughout the year. 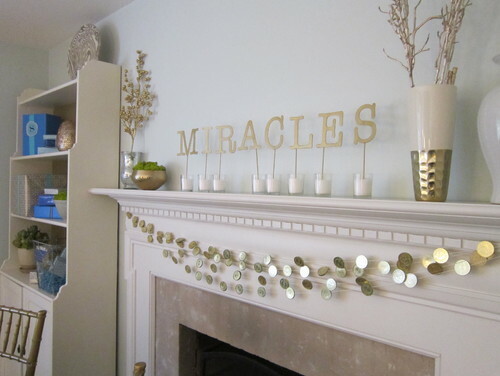 This garland was created using some of those cheap gold coins that can be found just about anywhere. It is a simple, easy and yet very cute way to create a unique look. 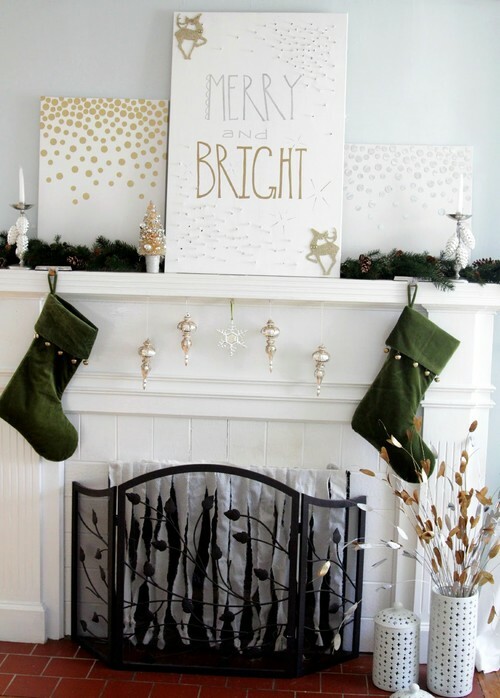 Another easy DIY mantel garland, made from burlap, graces this lovely fireplace. A swag over the mirror and a few glass containers filled with some leftover balls, and you are good to go. This mantel looks very elegant, but is made from just a collection of backyard pinecones and a spare strand of lights wrapped around some faux holly berries. If you don’t have any good holiday wall art, throw a few DIY canvas art pieces together. Add your stockings and a few tree ornaments and voila! You now have a nice understated Christmas mantel. 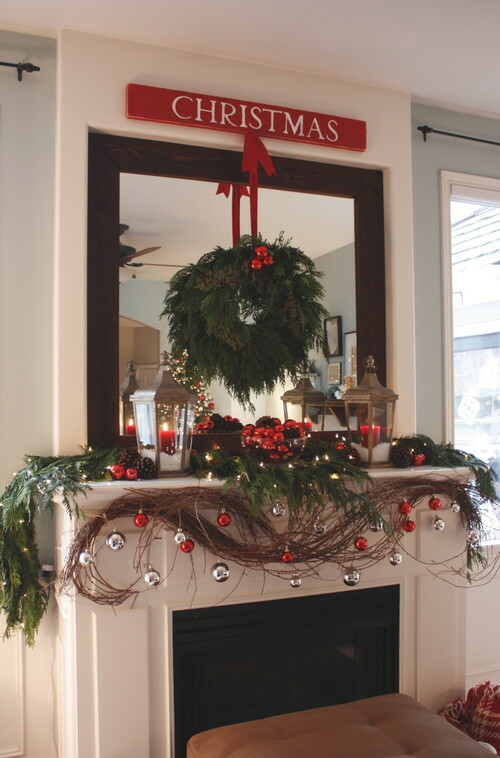 This mantel lends a little bit of farmhouse charm to the Christmas decor. 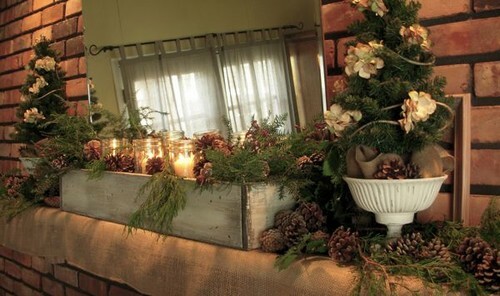 A burlap runner provides a nice foundation for the decorations. A trip to the backyard for some pine cones and cedar clippings goes a long way to achieving this look. A few old jars and some votive candles placed in an box, constructed from scrap wood, finish it up nicely.